Justin Trudeau announced the first 15 members of the Prime Minister’s Youth Council, this morning. The young leaders, ages 16 to 24, were chosen from over 14,000 applications across the country. They will work with the prime minister to establish and broaden youth engagement initiatives in Canada. 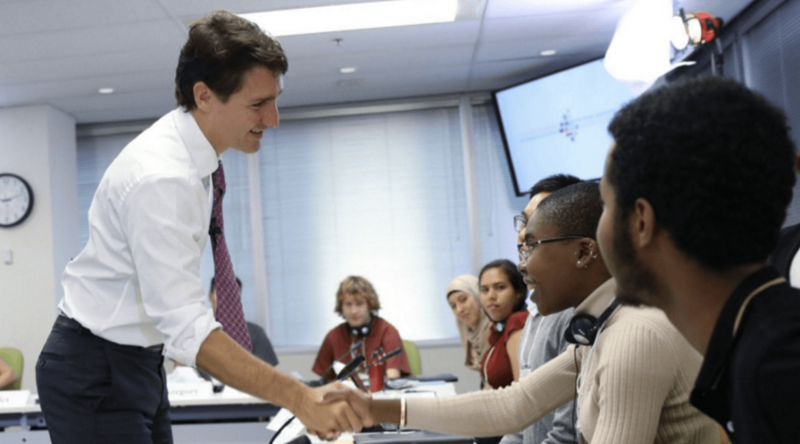 “Countries that do not use the talents of all their citizens – regardless of ethnicity, gender or age – risk finding out that the status quo is no way to meet the very real challenges they face,” said Trudeau in a release. The Youth Council met with the prime minister this morning. Later this week, they will get straight to work, discussing youth employment, environment and climate change, gender-based violence, and youth services. The group will also be working with policy leaders, Cabinet ministers, the Parliamentary Secretary for Youth, and other senior officials. The council is composed of youth from very diverse backgrounds with a range of life experiences. Mustafa Ahmed, grew up in Toronto’s Regent Park, which is also the largest social housing project in Canada. Ahmed is committed getting youth involved in arts and literature community programs, as well as helping new immigrants adjust to Canada. Nmesoma Umenwofor-Nweze, is originally from Nigeria but grew up in Iqaluit, Nunavut. She is passionate about mental health initiatives and active living programs for youth in her community. If you missed out on this year’s chance to apply for the council , you can apply for the second round of applications until October 7. You must be between the ages of 16 and 24, and if selected, you will participate in the 2017 Youth Council meetings.